SUVA: Pacific media commentator David Robie's new book, Mekim Nius, makes a strong case about the need for journalists in the region to receive education and training to help them become more credible and effective watchdogs of democracy. Education, says Dr Robie, will provide journalists with critical studies and the ethical and contextual kowledge needed to be effective communicators and political mediators in the Pacific. Given the misuse of power by governments, human rights violations and the people's descent into abject poverty in many island countries, Dr Robie's message to the media - to have a relook not only at its form and function but how it is carrying out its social obligations - is very timely. He says the media needs to play a far more important role in the nation-building process and the way to do that is have better trained journalists. 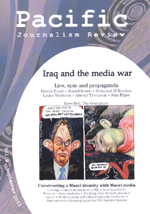 The issues of pay and cultural factors raised in Mekim Nius pose serious questions about the impact these may have on the autonomy of journalists and the Fourth Estate role of news media in a South Pacific democracy. Dr Robie has long campaigned for better salaries and working conditions for journalists, not just to attract better qualified people, but to retain experienced journalists often targeted by corporate companies, PR firms and NGOs. Now a senior lecturer and publications coordinator in Auckland University of Technology's School of Communication Studies, Dr Robie, practised and taught journalism in the South Pacific for more than two decades. He is thus well acquainted with the attacks on media freedom by some governments in the region and has documented them. One of the pretexts used is to attack journalism standards to justify bringing in new legislation to clip the media's wings, as was threatened in Fiji recently. It goes without saying that if journalists are better educated, they will do a better job and not hand governments a gun to shoot them with. The book draws on interviews, research, two news industry surveys and the author's personal experiences as a journalist and educator. 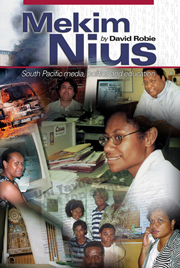 Published by the University of the South Pacific Book Centre, Mekim Nius includes historical case studies of the region's three main journalism schools - University of Papua New Guinea, Divine Word University (Madang, PNG), and the University of the South Pacific. Dr Robie also questions international aid policies in the region and the culture of 'short course media training'. Traditionally - with the exception of PNG where university education has been the norm - the region's journalists have mostly learned on the job in the newsroom or through vocational short courses funded by foreign donors. 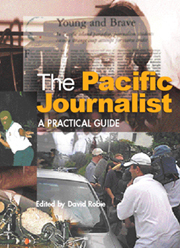 However, Dr Robie is of the view that today's Pacific journalists now more than ever need an education to contend with the complex cultural, development, environmental, historical, legal, political and sociological challenges faced in an era of globalisation. The book also touches on ownership issues, government, corporate, institutional and cultural pressures, pay and working conditions, and training and development concerns as voiced by journalism practitioners, educators and students in the Pacific Islands. Mekim Nius is also a tribute to the pioneers of journalism education in the region. It tells the story of Ross Stevens, Michael King, Father Frank Mihalic and others in PNG from the 1970s and describes the later efforts of Murray Masterton and then Francois Turmel to get journalism education going in Fiji.